The heart is able to contract on its own because it contains specialized cardiac muscle tissue that spontaneously forms impulses and transmits them to the myocardium to initiate contraction. This specialized tissue forms the conduction system of the heart, which consists of the sinoatrial node, atrioventricular node, AV bundle, bundle branches, and ventricular fibers. 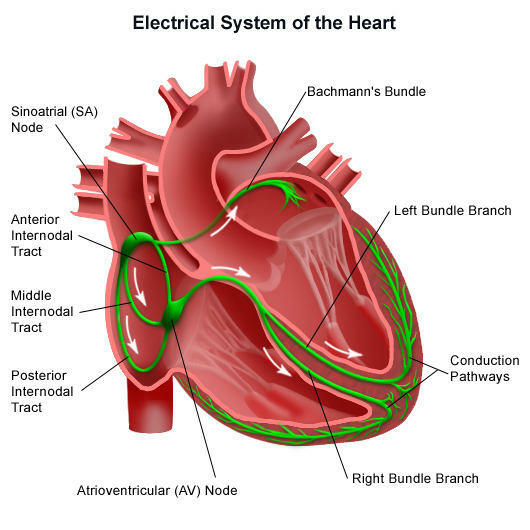 Observe the location of the conduction system and its parts. The sinoatrial node (SA node) is located in the right atrium at the junction of the superior vena cava. It is known as the pacemaker of the heart because it rhythmically forms electrical impulses to initiate each heartbeat. The impulses are transmitted to the myocardium of the atria, where they produce a simultaneous contraction of the atria. The flow of impulses causes contraction of the atria from superior to inferior, forcing blood into the ventricles. At the same time, the impulses are carried to the atrioventricular node (AV node), which is located in the right atrium near the junction with the interventricular septum. There is a brief time delay as the impulses pass slowly through the AV node, which allows time for the ventricles to fill with blood. From the AV node, the impulses pass along the AV bundle (bundle of His), a group of large fibers that divide into left and right bundle branches extending inferiorly to the interventricular septum and superior to the lateral walls of the ventricles. The smaller ventricular (Purkinje) fibers arise from the bundle branches and carry the impulses to the myocardium of the ventricles, where they stimulate ventricular contraction. The distribution of the ventricular fibers causes the ventricles to contract from the apex superiorly so that blood is forced into the pulmonary trunk and aorta. The origination and transmission of impulses through the conduction system of the heart generate electrical currents that may be detected by electrodes placed on the body surface. An instrument called an electrocardiograph is used to transform the electrical currents picked up by the electrodes into a recording called an electrocardiogram (ECG or EKG). A normal ECG of five cardiac cycles and an enlargement of a normal ECG of one cardiac cycle. Note that an ECG consists of several deflections, or waves. These waves correlate with the flow of impulses during particular phases of the cardiac cycle. An electrocardiogram has three distinct waves: P wave, QRS complex, and T wave. The P wave is a small wave. It is produced by the depolarization of the atria. The QRS complex is produced by the depolarization of the ventricles. The greater size of the QRS complex is due to the greater muscle mass of the ventricles. The last wave is the T wave, which is produced by the repolarization of the ventricular myocardium. The repolarization of the atria is not detected because it is masked by the stronger QRS complex. An ECG provides important information in the diagnosis of heart disease and abnormalities. In reading an ECG, physicians pay close attention to the height of each wave and to the time required for each wave. The conducting system of the heart is composed of specialized cardiac muscle fibres (not nervous tissue) and is responsible for initiation and conduction of cardiac impulse. The conducting system of the heart is composed of the following 5 components:. Left and right branches of bundle (of His). It’s a small horseshoe-shaped mass having specialized myocardial fibres, situated in the wall of the right atrium in the upper part of sulcus terminalis just below the opening of superior vena cava. It’s called pacemaker of the heart since it generates impulses (about 70/minute) and initiates the contraction of cardiac muscle producing heart beat. It’s smaller compared to the SA node and lies in the lower part of the atrial septum, just above the connection of septal cusp of the tricuspid valve/opening of the coronary sinus. It conducts the cardiac impulse to the ventricle by the atrioventricular bundle. The AV node is capable of generating impulses at the rate of about 60/min. The speed of conduction of cardiac impulse (about 0.11 sec) gives sufficient time to the atria to empty their blood into the ventricle before ventricles start contracting. It begins from AV node, crosses the AV ring and runs along the inferior part of the membranous part of the interventricular septum where it divides into the right and left branches. Since the skeleton (fibrous framework) of the heart separates the muscles of atria from the muscles of the ventricles, the bundle of His is the only means of conducting impulses from the atria to the ventricles. The right branch enters down the right side of the interventricular septum and after that becomes subendocardial on the right side of the septum. A large part of it continues in the septomarginaltrabeculum (moderator band) to reach the anterior papillary muscle and anterior wall of the ventricle. Its Purkinje fibres then spread out underneath the endocardium. The left branch descends on the left side of the ventricular septum, divides into Purkinje fibres that are distributed to the septum and left ventricle. They’re the terminal branches of left and right branches of the bundle of His and spread subendocardially over the septum and the rest of the ventricular wall. The SA node (a spontaneous source of cardiac impulse) initiates an impulse which rapidly spreads to the muscle fibres of the atria, making them to contract. The AV node picks up the cardiac impulse from atria and conducts it via atrioventricular bundle and its branches to the papillary muscles and the walls of the ventricles. The papillary muscles contract first, to tighten the chordae tendinae and after that the contraction of ventricular muscle takes place. The whole of the conducting system of the heart is provided by the right coronary artery with the exception of a part of the left branch of the AV bundle that is provided by the left coronary artery. The defect/damage of conducting system causes cardiac arrhythmias. The SA node is the spontaneous source of generation of cardiac impulses. The AV node picks up these impulses from atria and sends them to the ventricles via AV bundle, the only means via which impulses can spread from the atria to ventricles. If the AV bundle fails to conduct normal impulses, there takes place alteration in the rhythmic contraction of the ventricles (arrhythmias). If complete bundle block takes place there’s complete dissociation in the rate of contraction of atria and ventricles. The common cause of defective conduction via AV bundle is atherosclerosis of the coronary arteries which leads to diminished blood supply to the conducting system. The rapid pulse is referred to as tachycardia, the slow pulse is named bradycardia on the other hand irregular pulse is named arrhythmia.